Whether they are for Quidditch or other professional sports, fun or simple transportation, flying broomsticks are a crucial part of a witch or wizard. Until the 20th century, the brooms were individually made by broom-makers, but with the creation of Cleansweep Broom Company in 1926, broomsticks became a much more reliable and consistent product. Join the ranks of broom-makers and illustrate a new broom, then tell us something about it. What is it called? Is it a racing broomstick? Perhaps, it is suited for longer travels? What is it made of? How it came to be? The writing must be at least 100 words long and both pieces need to adhere to all HOL rules. Post your picture of a broom (600x600 or less) and the writing piece below by October 31st 11:59 pm HOL time for 20 Hoots and 20 beans. This type of broom is called Thomas 535 after its creator, Eno Thomas. The number 535 indicates the number of days it took him to create the broom. Thomas 535's main characteristic is comfort. It's a broom design mostly for travelling, may it be long or short. It can be used for different daily and weekend activities such as flying to work, flying somewhere peaceful and lonely for the weekend, flying around the town etc. Thomas has enough room for parents to keep a little child in front of them, of course security measures should be followed strictly. You can use this kind of broom for other purposes as well such as drying your clothes by letting it float in the air or cleaning your home. Thomas comes in three colors as in the picture. Thomas 535 is made mostly of oak, which is known to be a very durable wood combined with bits of birch and hazel. 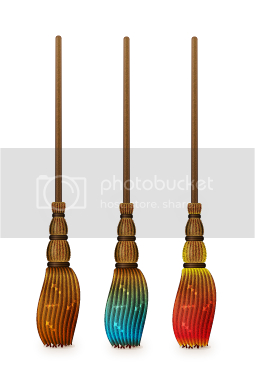 P.S: The brooms are made from scratch in Adobe Illustrator. Eno Thomas gets 20 Hoots and beans!